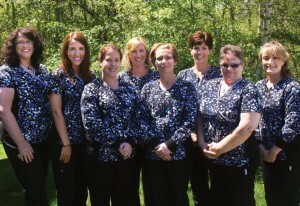 Dr. Michele Spekhardt has been providing exceptional dental care for over 20 years! Dr. Spekhardt earned her undergraduate degree from the University of Maine in 1984 and her dental degree from Tufts University School of Dental Medicine in 1990. After graduating from dental school, she started practicing in Brooks, Maine at the Jewell Dental Clinic. In 1994, she bought this practice from a retiring Bangor dentist. Dr. Spekhardt feels it is important to stay on the cutting-edge of dentistry. Thus, she maintains memberships in many prestigious professional organizations to keep up-to-date on the latest techniques and technology including the American Dental Association, Academy of General Dentistry, Academy for Sports Dentistry, American Academy of Dental Sleep Medicine, American Academy of Craniofacial Pain, Maine Dental Association and the Penobscot Valley Dental Society. Dr. Spekhardt volunteers her time, knowledge, and skills to Donated Dental Services, an organization serving people with disabilities or who are elderly or medically at-risk. In her free time, she enjoys the University of Maine ice hockey, continuing education courses and attending her children’s sporting events.